The rights of residential tenants are legally protected in the State of New Jersey. There is a law called the Fair Cause for Eviction Act. N.J.S.A. 2A:18-61.1 et. seq. also known as the Anti-Eviction Act. that protects tenants from being evicted without cause. Almost all tenants are covered by the Anti-Eviction Act. However, the law does not apply to tenants residing in buildings with three or fewer apartments where the owner lives in one of the apartments. This is known as the "owner-occupied" exception. 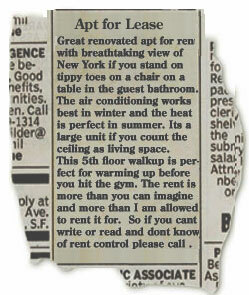 Tenants subject to the owner-occupied exception may be evicted at the end of the lease term for any reason. If you are a month-to-month tenant living in a building with three or fewer apartments and your landlord lives in one of those apartments, the landlord needs only to give you a month's notice to quit before taking you to court. Over the years we have handled hundreds of different landlord tenant matters and our experience will allow you, whether a landlord or tenant to get the most protection under the law. The relationship between a landlord and residential tenant is governed by many different laws, in many ways it is like a marriage. A written lease is like a pre-nuptial agreement, even though both parties sign and agree to the document it is still subject to being overridden by the Court if the Court finds the terms of the lease against public policy or the statutory laws governing the Landlord / Tenant relationship. A Landlord who leases an apartment without a written lease is like a marriage without a pre-nuptial agreement. The duties and obligations of the parties will be determined by the laws governing tenancies as it does with marriage. In our practice we have represented both landlords and tenants. It is because we have an understanding of both parties and the law that we can often settle any issue between parties. However, we also have appeared in court to enforce the rights of our clients and do not hesitate to litigate a dispute if it is obvious that the other side will not compromise their position. To set up a consultation concerning any residential tenant matter, contact us online or call us at (201) 656-1000.